Camden County law enforcement captured a man who allegedly sexually assaulted and then attempted to kill a woman on a city street. According to officials, the suspect attacked the female victim last week on the 900 block of South 3rd Street in Camden, NJ. The suspect reportedly kidnapped the victim, took her to an abandoned lot, and sexually assaulted her. 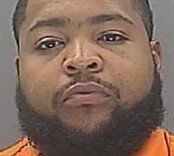 The suspect, a 29-year-old Willingboro man, was identified by Camden County authorities after the victim provided information for a detailed composite sketch of her attacker. Just a few hours after releasing the sketch to the public, police identified the suspect and located him in Willingboro, New Jersey. Willingboro NJ cops and Camden County detectives obtained a search warrant for the suspect’s house and went to the residence. That’s where they found the suspect, who allegedly grabbed a knife and tried to attack the police officers. He was subdued and arrested. The suspect has been charged with several crimes, including attempted murder, aggravated sexual assault, sexual assault, kidnapping, robbery, unlawful possession of a weapon, and possession of a weapon for an unlawful purpose. After being placed under arrest and charged, the suspect was remanded to the Camden County Jail on a $2 million bail amount.